Lost names ask questions – For the fainthearted . . .
Objectors to remembrance ceremonies and the wearing of poppies have failed to understand their power to challenge people’s thinking, they have failed to appreciate the opportunities created to speak of peace and to challenge militarism. Tell the full story of the Western Front and it creates a sense of anger and revulsion at the horrors experienced. 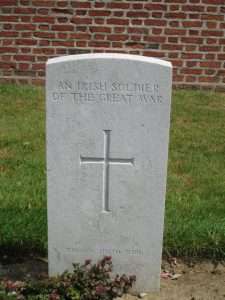 Accustomed to encountering graves of unknown soldiers while walking through the Commonwealth war cemeteries of Picardy and Flanders, it was a request from a friend for a photograph of a stone marking the grave of “An Irish Soldier of the Great War” that brought the realisation of what it meant to be “unknown”. 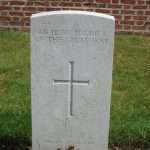 Some unknowns are specific, the stone states that the grave was of a soldier, a sergeant, a lieutenant of a particular regiment, even among the ranks of the officers it being not always possible to determine which gathering of human remains had once been which officer. Some unknowns are defined by nationality. 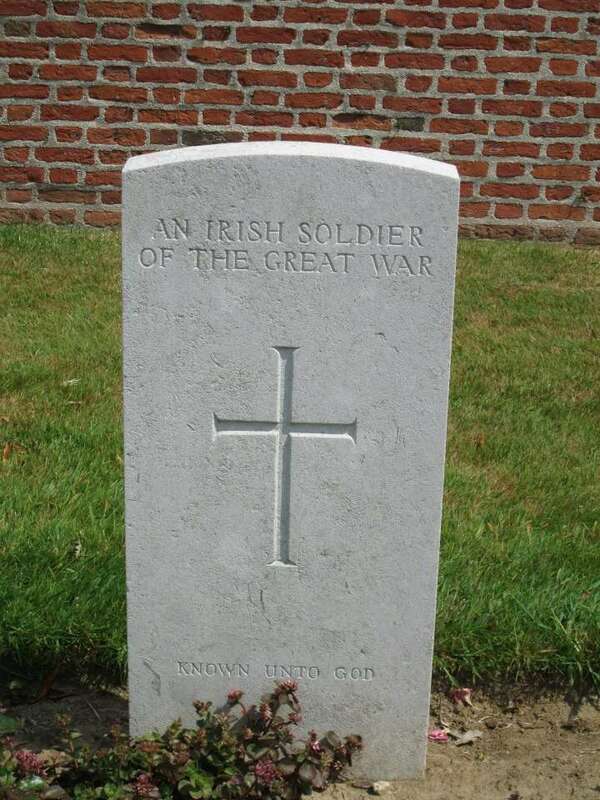 A stone commemorating “An Irish Soldier of the Great War” means it must have been possible to determine that the soldier had served in an Irish regiment, but no more information had been available. There are similar nationality-based inscriptions: Australians, Canadians, and, of course, “A British Soldier of the Great War”, so many British soldiers of the Great War. The inscriptions mean There had been insufficient clues as to the men’s identity to give them names or ranks or even regiments, but it must have been that the shreds of uniform still attached to whatever had remained of the corpses had shown the men had served among the soldiers from particular countries. The explanation brings home the horror of what the inscription, “A Soldier of the Great War” really means. There was not sufficient found to determine even what country this man had left to die in this hell. “A Soldier of the Great War” means so little was found, not even enough shreds of a uniform, no British khaki or French blue, or German grey, that the human remains could not even be identified with a country. Or, young Willie McBride, was it slow and obscene? The inscription “A Soldier of the Great War” expresses the bloody obscenity of the war to end all wars; in the sparseness of its words it conveys unimaginable horror. The words are sufficient to make anyone ask questions of those who would still speak of war as noble. Another reason came about with the use of HE shells. It was known with proximity explosions, rare before their wide use in WW1, the blast wave would strip the clothes from a man. But it would also leave the body perfect, without a mark, but inside that organs would be liquefied.